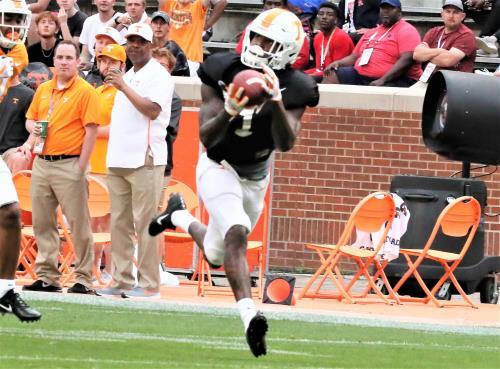 Marquez Calloway hauls in a 52-yard reception in the first half of the 2019 Orange and White game played Saturday night at Neyland Stadium. Calloway's catch set up a score by the White team, who went on to win the contest, 28-10. KNOXVILLE – When he met with the media more than two weeks ago, Tennessee’s Jim Chaney unwittingly offered a preview of Saturday’s Orange & White Game. UT’s veteran wide receivers played good ball to conclude spring practice before an announced crowd of 50,967 at Neyland Stadium. Jennings, Callaway and Palmer combined for 10 catches for 143 yards and three touchdowns for the White team in its 28-10 victory over the Orange. They achieved their production within the context of typical spring game that was very basic in its scope. Jennings, a redshirt senior, had five catches for 57 yards and two touchdowns. He jumpstarted the White’s first scoring drive with a 31-yard catch on a slant route. His best TD catch arguably was in the third quarter when he went up over a defender in the right corner of the end zone to snag a 7-yard pass. Of Callaway’s two catches, one covered 52 yards on a deep throw from Guarantano up the left sideline. Palmer, who was named the most improved offensive player of the spring by the coaching staff, had three catches for 25 yards and a touchdown. His TD catch, a one-yarder, came in heavy traffic in the back of the end zone. He finished with an impressive 20-yard catch-and-run play in the fourth quarter but took a hard hit on the play and had to be helped to the sideline. First-year assistant head coach Tee Martin, who works with the wide receivers, praised Palmer earlier in the week for the 6-foot-2 junior’s progress and potential. Thanks to the catches by Palmer and his teammates, the White team's Guarantano received the game’s most valuable player award. The redshirt junior was 19-for-37 passing for 198 yards and four touchdowns. As for the defense, inside linebacker Shanon Reid had 10 total tackles (eight solo) and broke up a pass for the Orange. Fellow linebacker Daniel Bituli, who was named the most improved defender of the spring by the coaches, lauded Reid for his improvement. “He’s a hard-working guy who’s eager to learn and get better,” Bituli said. Defensive back Jaylen McCollough, a freshman early enrollee, intercepted two passes for the White. One came on a nice break on a pass from fellow freshman Brian Maurer. McCollough broke up another pass and had seven tackles.